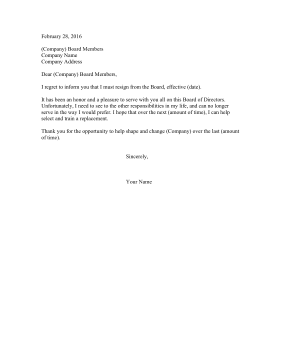 Use this printable resignation letter to resign from the Board of Directors. I regret to inform you that I must resign from the Board, effective (date). It has been an honor and a pleasure to serve with you all on this Board of Directors. Unfortunately, I need to see to the other responsibilities in my life, and can no longer serve in the way I would prefer. I hope that over the next (amount of time), I can help select and train a replacement. Thank you for the opportunity to help shape and change (Company) over the last (amount of time).